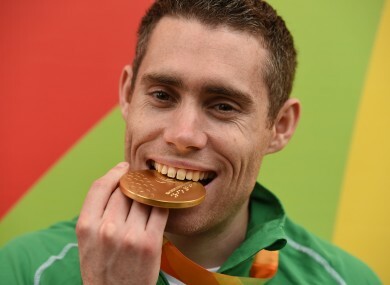 JASON SMYTH DESCRIBED winning his fifth Paralympic gold as a fairytale that he hopes never ends. The Irish sprinter stormed to a third successive T13 100m title this morning as he enhanced his reputation as the fastest Paralympian on the planet. A quick start allowed him to take control of the race at Rio’s Olympic Stadium and it was clear with 50m remaining that Smyth was on his way to defending the crown he won in Beijing and London. The world record he set four years ago was never in danger of being broken but it mattered little as the rest of the field, including two home favourites and Namibian Johannes Nambala, were left behind. “I’m over the moon, it’s my third consecutive Paralympic games and to win my fifth gold medal is incredible, you know I have been saying it, it’s a bit like a fairy tale really to come to these major championship and keep winning gold,” the 29-year-old said afterwards. Although he qualified fastest from his heat on Thursday, Smyth was acutely aware of the threat Nambala, in particular, posed. Nobody has ever come close to dethroning Smyth but if one athlete was going to do it, it was going to be the 25-year-old Namibian. Paralympics Ireland Athletics coach James Nolan admitted that Smyth knew he was going to have a race on his hands. “I suppose after watching last night you knew he [Smyth] was going to have a race on his hands, he knew he was going to have a race on his hands,” Nolan said. “He knew the Namibian, we had seen him in Lyon three years ago. Huge talent, very bio-mechanically raw. We also knew Frankie Fredericks was getting involved with the Namibian Paralympic Association so your worry is that this guy is going to tidy him up and he has potential to run 10.5 or 10.4. In the end, it wasn’t even a contest as Smyth underlined his power and dominance at this level to leave Nambala and bronze medallist Chad Perris in his wake. He ran with such conviction that there really shouldn’t have been any doubt. “Everything was going good, you know obviously the turnaround between time, heats and final wasn’t ideal it was quite quick, but you know I have ran quick this year, I feel like I was able to get through the heats well, doing enough but not killing myself,” Smyth continued. “I was ready to go and today I knew I had to step it up another notch and I feel like I was able to do that. At the end of the day times are great, if I could have came out here and ran fast or ran a world record then incredible but as long as you cross that line first the rest if forgotten. “I didn’t think I started as well over the first 10 metres as I should have, but I knew if I opened up the gap, it would put them guys under pressure and it’s very difficult to come back in the 100 metres because you just don’t have enough time to do anything. Shortly after slowly making his way around the press mixed zone in the bowels of the vast, but sparsely populated, stadium, Smyth made his way back onto the track for the medal ceremony. Presented with his gold by Minister for Tourism and Sport, Patrick O’Donovan, the Eglinton athlete savoured his moment in the spotlight because his interest in this Games is now over. The removal of the 200m event from the programme means Smyth will spend the remainder of the competition in training mode, taking advantage of the slightly better weather than at home as well as the Olympic facilities. “Absolutely [disappointed not to be racing again], double gold at Beijing, double gold at London; the next step was the double gold attempt at Rio,” he added. “It would have been incredible to have a go at that here. I have known for three or four years that it wasn’t going to be, so I have well let it go at this stage. Smyth’s disappointment can at least be tempered by the fact he has yet another gold medal hanging around his neck. Email “'It's like a fairytale to keep coming to these major championships and winning gold'”. Feedback on “'It's like a fairytale to keep coming to these major championships and winning gold'”.